A fully-integrated and generative, structural analysis solution for engineers and analysts. MSC Apex Structures is an add-on product which expands MSC Apex Modeler functionality with capabilities for linear structural analysis. 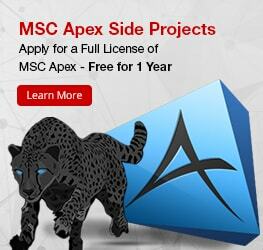 MSC Apex structures packages a user interface for scenario definition and results post-processing, as well as integrated solver methods. This solution is unique in that it combines computational parts and assemblies technology with a generative framework, which enables interactive and incremental analysis. The integration of the user interface with solver methods gives the user a unique ability to interactively and incrementally validate that FEM models are solver ready. At the user’s demand, a series of solver checks can be run against individual parts and assemblies and the model diagnostics are reported in the Analysis Readiness panel. This Incremental Validation is a radical departure from the very time consuming traditional approach where pre/post processor and solver are separate. In addition, a frequency response analysis type and a specialized results exploration toolset is available to aid engineers improve the vibration behavior of structures. The integrated toolset of MSC Apex enables analysts to experiment with mode contributions and develop design solutions to mitigate and control structural vibrations, all without committing to excessive modeling changes and re-analysis.